Dr. Siegel is the System Chief, Interventional Radiology Services, North Shore LIJ Health System, and Associate Professor of Radiology, Hofstra-North Shore LIJ School of Medicine, New Hyde Park, NY. A 39-year-old female patient, SG, presented with painful varices in the lower extremities and pubic region after having several failed saphenous vein procedures. Following consultation and venography, diagnoses of pelvic congestion and iliac vein compression, or May-Thurner Syndrome, were made. The latter was treated successfully with stenting of the iliac vein; the gonadal veins were embolized bilaterally after venographic confirmation of reflux. Over the next 8 years, the patient underwent 11 additional procedures to treat symptomatic recurrences. Although the patient’s symptoms completely or nearly completely resolved following each successful procedure, they were rarely in control for more than 6 to 8 months. As the patient’s varicosities recurred, it became increasingly more difficult to obtain access to them and to perform sclerotherapy, especially when they began to develop in the inferior pelvis, causing pain and a burning sensation involving the pelvic floor. Pudendal veins, cross pelvic collateral veins, recanalized portions of the saphenous vein and many unnamed veins were accessed and/or treated in subsequent sessions. An example is seen in Figure 1, a venogram from one of those procedures. 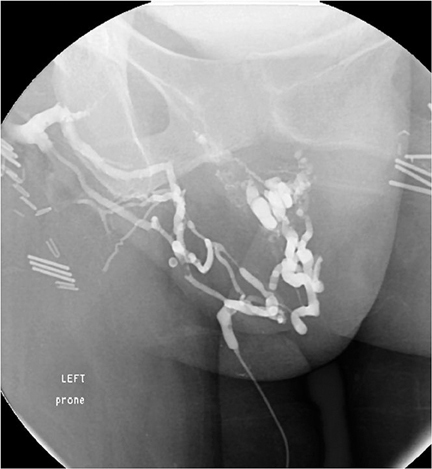 Injection of contrast is being performed via microcatheter, which was manipulated into the visualized pelvic floor veins via the vein of Giacomini. This was then used for sclerotherapy. Figure 2 demonstrates a direct puncture through the perineum, which was used for access to some of the deep pelvic varices at a subsequent procedure. In this circumstance, direct access to a sizable pelvic vein for sclerotherapy would be quite advantageous, but the issue is safely guiding a needle to the mid-pelvis accurately and reliably to avoid traversing any unwanted or dangerous pelvic structures. Figure 3, obtained at the last procedure, is a venogrom obtained by direct puncture of a posterior division branch of the left hypogastric vein using the planning functionality of XperCT and XperGuide. 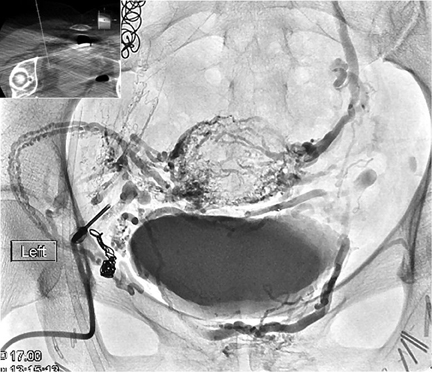 Contrast injection beautifully demonstrates the symptomatic pelvic venous plexi, including the periuterine/periovarian plexus and the dilated veins surrounding the urinary bladder, communicating with the deep peroneal veins. Following this venogrom, 3% sodium tetradecyl was injected through the needle and allowed to dwell in place with the patient in the semi-upright position for 25 minutes. 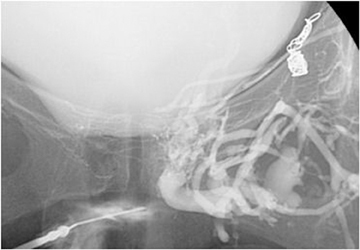 This procedure was performed about 1 year prior to the preparation of this case report and the patient has remained asymptomatic during that time, which is her longest symptom-free interval since presentation. Pelvic congestion syndrome, or ovarian venous incompetence, was originally described in 19581 and the name pelvic congestion syndrome first appeared in the literature in 1976.2 For many years, this was a misunderstood and underdiagnosed entity. The confusion is primarily due to the variable clinical presentations and the wide variations in response to endovascular therapy. As there are a myriad of etiologies for pelvic pain and many patients are asymptomatic with respect to their pelvic varices, treatment failures are not uncommon. Additionally, many patients have simple ovarian vein incompetence with involvement of one or both ovarian veins, while others have some contribution from the internal iliac system.3 The latter situation can lead to treatment failures or incomplete symptom resolution following gonadal vein embolization alone. Pelvic congestion syndrome is a complex condition, the hallmark of which is ovarian vein reflux and symptomatic pelvic varices. This case of recurrent pelvic varices after embolotherapy illustrates how XperCT and XperGuide can support direct access for sclerotherapy after numerous procedures have essentially eliminated the conventional vascular access routes. While this specific situation is quite rare, it is the author’s hope that practitioners will consider cone-beam CT and dedicated needle guidance when faced with other situations where direct deep vascular access would be advantageous. Topolanski-Sierra R. Pelvic phlebography. Am J Obstet Gynecl. 1958;76:44-45. Hobbs JT. The pelvic congestion syndrome. Practitioner. 1976; 41:41-46. Ignacio EA, Dua R, Sarin S, et al. Pelvic congestion syndrome: Diagnosis and treatment. Semin Intervent Radiol. 2008;25:361-368. Treating recurrent pelvic congestion. Appl Radiol.